Stocking-Up on Nutrition Month Essentials! 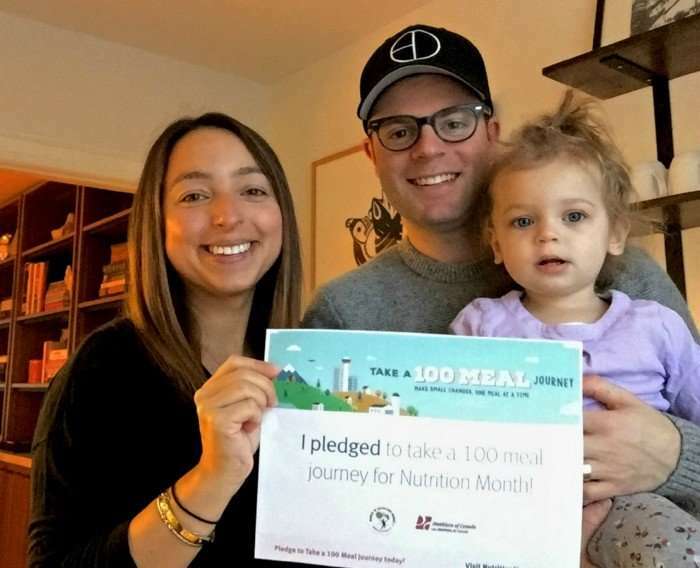 The Etherington family with their Nutrition Month pledge. WhereParentsTalk.com is proud to announce our participation in Nutrition Month by tracking one family’s mission to eat healthier meals at home. We will update on their journey every week along with expert feedback on the concrete steps they are taking towards achieving their goal. When I was first approached to work with Corey and her husband Ross on their 100 Meal Journey as part of Nutrition month this year, I knew the first place we needed to meet was the Etherington house. Ross and Corey, both work full time, Edie, their toddler is in daycare, and in April they will welcome baby number two. Life is already busy for the Etherington’s and it is about to become even more hectic! My best recommendation for busy individuals and families is to create proper meal plans. When looking to cook more, it is important to make sure you are well prepared with a well-stocked kitchen; this goes hand in hand with creating meal plans. Cooking something new can be quite the task when your pantry and fridge aren’t stocked properly! This is something I notice very regularly when I go into my clients’ personal kitchens to help them with creating meal plans. It is much easier to cook a meal when all you have to do is go into your cupboard or fridge for 75% of the ingredients. Corey and Ross happen to have a pretty well stocked kitchen, so when I went looking through their fridge, freezer and pantry, they had the majority of things on my Kitchen Essentials list. Not only does this list include food items, but kitchen tools are equally as important. I myself recently purchased all new knives (translation: 3 knives, that’s all you need!) and chopping my ingredients has become way less of a chore. Anything to make a task that seems daunting easier is completely worth it. See below for a breakdown of all the kitchen essentials you need to put yourself on the pathway to healthy eating! 1 Vacuum Sealer > This makes defrosting frozen meat and fish a 5-10 minute task prevents freezer burn. Now that the Etherington kitchen is ready I think it’s time to do some meal planning… stay tuned for that post next!